The thing about high concept fusion cuisines is that it is a sincerely risky operation, one which requires knowledge of food history, pairings, preparation, and the utmost attention to detail. That being said, Osaka has all of these in spades. Despite being nestled neatly on the side of Hollywood Blvd that is actually accessible, Osaka is easy to miss if don’t look carefully. Opening in summer 2011, this restaurant proudly touts an Asian Peruvian hybrid. The ornate, red lettering and glass platted lobby are like a beacon of elegance once you get up close. Valet is only $8 – not bad considering its location. The menu is fierce. It ain’t no Denny’s, but the initial listings of food varieties can be overwhelming. Luckily, the wait staff are very knowledgeable, helpful, and, above all, patient. Osaka prepares your palate with a slice of Peruvian potatoes in herb sauce. Their ceviche is uniquely satisfying and first timers will undoubtedly enjoy trying all 4 in the sampler plate. The ahi, on the other hand, is more visually appealing than it is tasteful. The duck lettuce wrap is an interesting dish with a little kick to it. If you don’t mind eating cooked duck from a lettuce leaf like a taco, then this is a deliciously filling dish. Lastly, the scallops they offer come served in a shell, smothered with baked cheeses and herbs. Never in my life have I enjoyed scallops until this day. 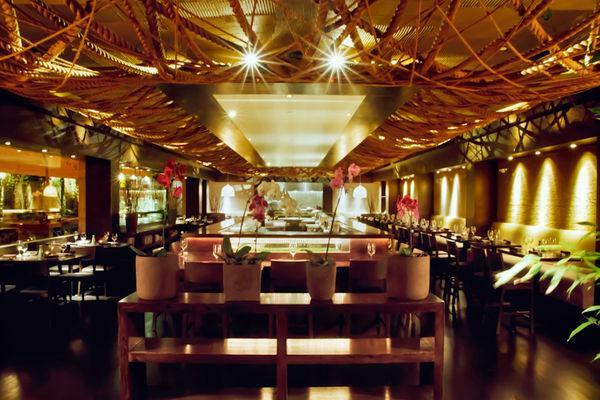 The entire restaurant (this place is huge) is done in a mahogany wood motif which gives the interior an air of elegance. Rope hangs from the ceiling because, hey, it’s better than looking at a plain old ceiling. The extremely low lighting is a bit too much for my taste, and in fact doesn’t do Osaka any favors when their cooks work tirelessly to create visually appealing plates that dinners can hardly see. Their background music is popular rock songs played at a low-mid volume – an interesting choice for this type of restaurant. During the course of our meal the piercing static pop of stereo cables being switched out went off a few times – definitely a disturbance. As we were leaving I found out why; they had a DJ in the lobby, turntables and all, still playing Top 40 types stuff. Home to some interesting and creative cocktails, as well as a wealth of top shelf sakes you wouldn’t find anywhere else, Osaka has no shortage of alcohol. It’s not a sake bomb shindig, but rather a destination for adventurous drinkers to try something new. Happy hour is 8-12 PM, where everything is discounted, which is an opportunity to take advantage of. Overall, Osaka embodies what one might consider “Hollywood fine dining”. 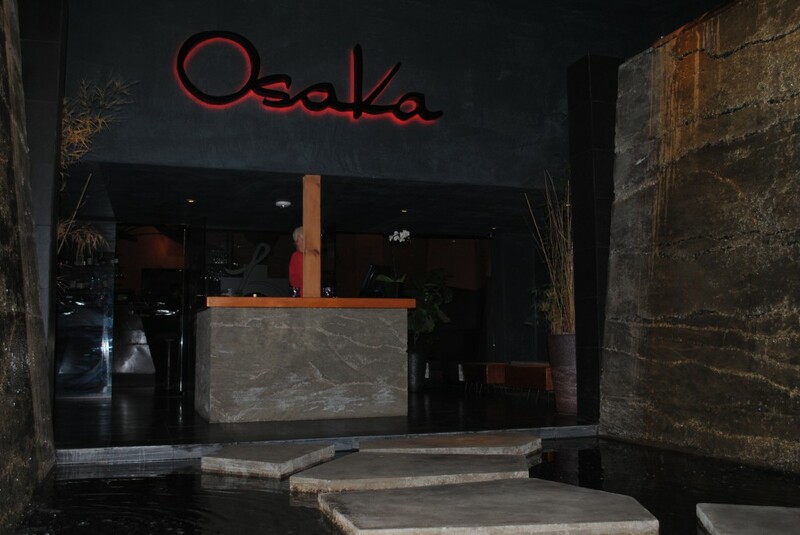 Great for business dinners, hot dates, or any situation where you need to “seal the deal”, Osaka is a nice way to treat your guests and yourself. Even if you know nothing of Asian/Peruvian cuisine, the staff is so knowledgeable that they can recommend pairings which are certain to satisfy. While we recommend that everyone give this place a try, if no other reason than it bringing a sliver of class to your otherwise debaucherous evening, the adventurous eater would surely get a kick out of Osaka.